Brittany is on the west coast of France and in summer it has a warm temperate climate. It does rain sometimes, which is one of the reasons its countryside is so green and wooded, but it would be an unusual week in summer if there was not more sun than cloud. It can get pretty hot in the summer months, up to about 35 degrees, but unlike France south of the Loire, you are unlikely to get scorched. The graph indicates that between June and August there are an average of eight hours of sunshine per day, with September and May not far behind with 7hrs. High pressure from the Azores gives southern Brittany more than 2,200 hours of sunshine per year. Northern Brittany, by contrast, has only 1,700 hours per year. Morbihan enjoys a mild and gentle climate, thanks to the effects of Gulf Stream. The stats say there is less rain in Morbihan over the year than there is in Provence! Overall Brittany has an ideal climate, but bring waterproofs as well as a sunhat! ​Check the French Meteo Web site for a current weather forecast for Brittany. This is the French state weather forecaster. The Morbihan region is warmer and more sheltered than the other Breton regions. 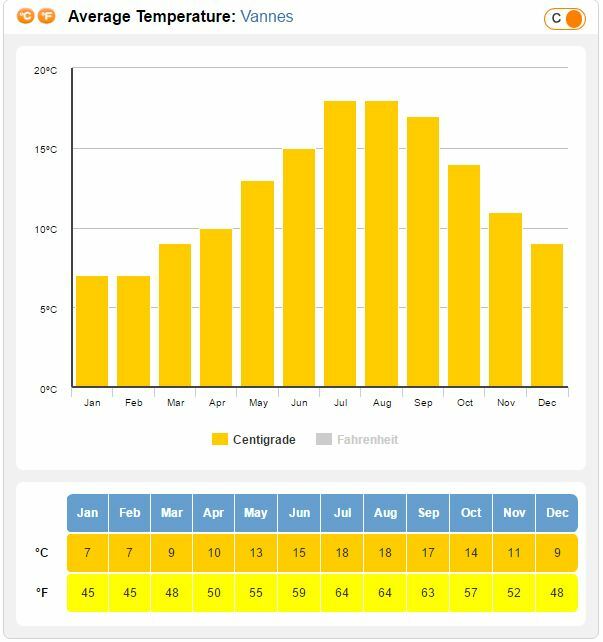 The charts indicate the average temperature by month for Vannes and the average number of sunny days per month. 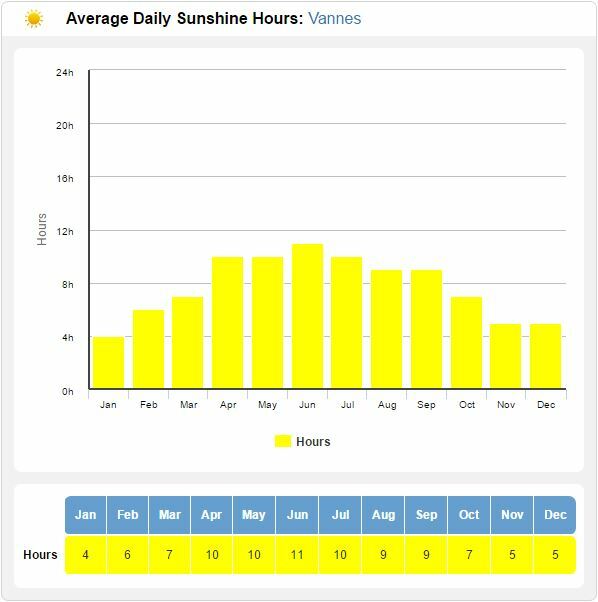 Average daily sunshine hours Vannes, Morbihan.